We just released fourdigits.seo v1.0 to https://pypi.python.org/pypi/fourdigits.seo/. 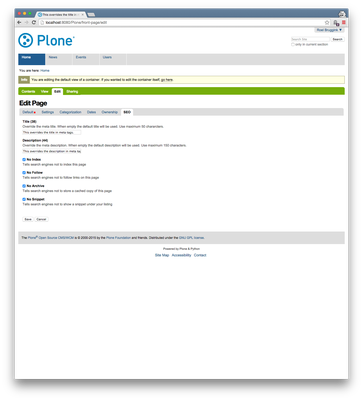 - The supported platforms for Publisher are Twitter Card, Open Graph and Google Plus. - The title and description of the login form, registration form and contact form can be overriden. - Favicon.ico and Apple Touch icons can be set. Publisher information for the major social media providers: Google Plus, Twitter Card and Open Graph. Add ‘fourdigits.seo’ to the eggs section of your buildout.cfg. 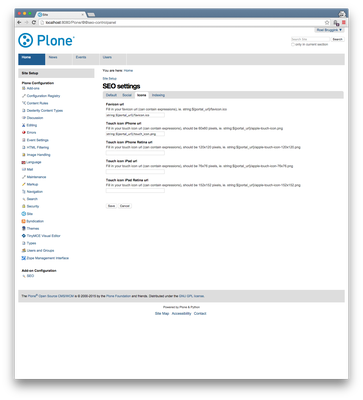 Install ‘SEO’ using the ‘Add-ons’ section in the Plone control panel. Enable the ‘SEO’ behaviour in the ‘Dexterity Contect Types’ in the Plone Control Panel. Note: the ‘Site wide settings’ are available without enabling the behavior.